South Central Ambulance Service NHS Foundation Trust, covers the counties of Berkshire, Buckinghamshire, Hampshire and Oxfordshire. The Trust covers an area of circa 4,600 square miles with a resident population of approximately 4 million. South Central Ambulance Service is a provider of emergency and urgent and transport services through 999 and NHS 111, right at the heart of delivering right care right time right place. We became an NHS Foundation Trust on 1 March 2012. 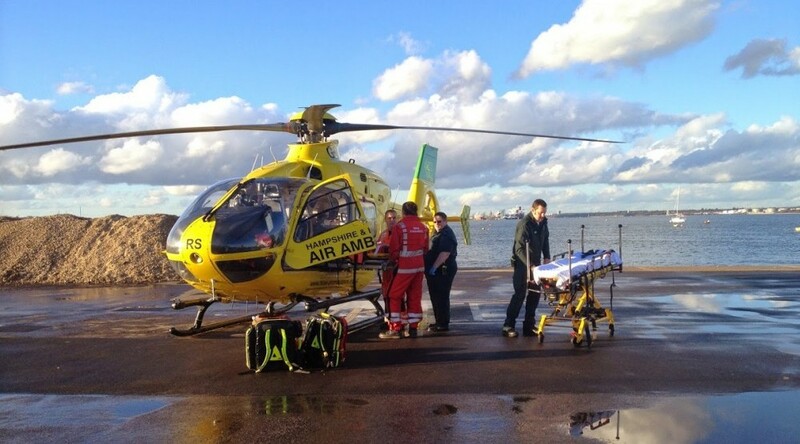 An exciting opportunity has arisen for the role of Air Crew (HEMS) Paramedics on the Hampshire & Isle of Wight Air Ambulance (“HIOWAA”) – Helimed 56 and the Thames Valley & Chiltern Air Ambulance (TVACAA) – Helimed 24. These posts are a full time three year fixed term contract opportunity and are open to both internal and external candidates, who meet the selection criteria; in light of this South Central Ambulance Service are looking for highly motivated Paramedics to undertake this exciting and challenging role. The role of our Air Crew is starting to evolve as we move towards a culture that promotes empowerment and involvement. Our vision is that our air operations will develop staff that are focused on the highest standards of care, which are continually achieved and maintained. Working closely with the Supervisory Management Team at Thruxton Air Base and RAF Benson, alongside our existing Air Crew, you will be responsible for ensuring that resources are used in the most effective way to deliver an excellent service. You will also take responsibility for ensuring that clinical governance is promoted and developed throughout the air operation of the Trust. Your excellent interpersonal and communication skills will mean that you are able to interact with other staff and patients alike, you will also be required to interact with the Charity as well as representatives of the Trust on a regular basis. You will be required to undertake charity events both on and off duty in a capacity as ambassador for the Trust and Charity. We are looking for individuals with demonstrable operational Paramedic experience who are able to demonstrate commitment to the value of patients in terms of clinical outcomes as well as being flexible and also able to meet the needs of the service. This should also be supported by a current CPD Portfolio . You are required to submit a 500 word CPD summary at the OSCE stage of this recruitment process. “HEMS” Air Crew on the Aircraft. (Plus RRV due to inclement weather). “HEMS” Dispatcher based in the EOC to task the Aircraft. The successful applicant will alternate through the above core elements of the role on a rotating shift pattern; this will be via a centrally planned roster. Please note local agreements will apply. (To discuss further please contact Pat Andrews or Neil Plant). Short listing against the Person Specification. Fitness test which will include: a “bleep”, swimming and manual handling assessment. An Observed Structured Clinical Examination (OSCE) on an ALS based scenario*. *Candidates must be “fully prepared” to take carry out these assessments on the day. The role will be demanding both physically and clinically and the successful candidate will be required to pass the two week “HEMS” air crew course which will include areas such as navigation, map reading, flight safety and aviation medicine. (Please note that the HEMS course is renewable on a yearly basis). The venue will be confirmed nearer the time. The successful candidate will be required to attend occupational health for an up to date health check. For internal candidates if your last DBS check is more than 3 years old, a new disclosure form will need to be completed. The successful candidate will need to be in a position to attend the two week CAA HEMS course which will commence on 11 May 2015, followed by the HCC (HEMS Crew Course) w/c 25 May for 5 days (in-depth medical course). The fitness assessments will be held on Friday 13 March, at Newbury Fitness and Wellbeing Centre. The orientation day and OSCE exams will be held w/c 23 March at either Thruxton Air Base or RAF Benson. The interviews will be held at Northern House, Bicester, Oxfordshire on Saturday 28 March Please note that if any candidate is on annual leave or has prior commitments and cannot attend on the above dates, no alternative dates will be offered. It is the individual’s responsibility to facilitate release with local managers and scheduling to attend the above dates. Please note that there could be a possibility of the 3 year contract being extended (this will be reviewed during the last six months of the three year period). We are also pleased to offer you a permanent contract back on the road once the fixed term contract has expired. There is a possibility of the 3 year contract being extended (this will be reviewed during the last six months of the three year period). You will return to your current base station after the contract has ended. However, you may or may not go back onto a fixed line; you might have to go on relief until such time as a fixed line becomes available. Would all candidates please state clearly in the supporting information section of the application form, your choice of base, e.g. Thruxton or RAF Benson. For an informal discussion about the role, please contact Pat Andrews, HEMS Team Leader on: 07500 818345 or e-mail: patrick.andrews@scas.nhs.uk for Thruxton or Neil Plant, HEMS Team Leader on: 07787 669162 or e-mail: neil.plant@scas.nhs.uk for RAF Benson. Please see the job description, person specification and additional information for further details. Communications regarding your application will be sent via NHS Jobs to your inbox. Please ensure that you are able to access your inbox on a regular basis to check for e-mails relating to your application. To ensure that your application is processed as quickly as possible, please ensure that you add e-mail addresses for your referees. Please note; we require at least three years worth of references with no gaps from at least two different referees. We will require references from all employers within this time-frame. If you do not provide sufficient information in the referencing section of your application form then we will take this information from the Employment History section of the form and will go directly to the organisations stated. Your referees will only be contacted after job offer. Holiday entitlement is 27 days per annum (based on full time hours) plus 8 bank holidays (bank contracts accrue one hour to every nine hours worked) and all employees can join the NHS pension scheme. The Trust operates a comprehensive Flexible Working Policy and employees can also take advantage of the NHS discounts and Key Worker Housing schemes. We operate an annual staff survey; our staff are encouraged to participate in project work and the Trust fully recognises and works in partnership with the trade unions. All applicants who have a disability and meet the minimum shortlisting criteria for the post will be invited for the next stage of the recruitment process. We aim to represent the diversity of our local communities and positively encourage applications regardless of age, race or ethnicity, gender, sexual orientation, disability, religion or belief.